We have a wedding reception to go to later this evening and I didn't have any wrapping paper for the gift, so I made some. It was so sweet seeing John's jaw drop when I pulled the present out of the bag - yeah baby I did THAT! The tag could use a little work and I'm thinking of redoing it before we leave - well actually I'll use my wacky scissors and make a pretty edge to the tag. There's about 9 yards of vintage binding ribbon, and threads, on here, I had to go around it several times to make it look like there was something on the package. Hmmmm I don't see any buttons, I have just enough time to fix that as well! 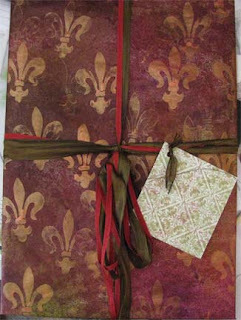 I used white butcher paper, distress inks, metallic paints, and a stamp to create this lovely covering.